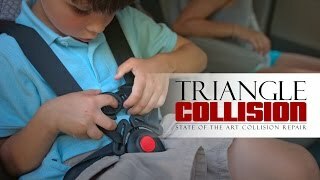 Triangle Collision is your trusted local Chevrolet Body Shop. We are a member of the Assured Performance Network with a proven history of high quality Chevy repair. Our technicians are equipped with Chevrolet approved tools and repair procedures so that you can feel confident that your vehicle will be restored to pre-accident condition. We stand behind our collision repair with Lifetime Warranties for many of our services. Our factory approved technicians know the unique needs of your Chevrolet and only follow manufacturer guidelines when preforming repairs. Having a Chevrolet body shop you can trust is important. We have put more training, and more investments into our equipment than most other collision centers in the area so that we can guarantee the quality of our Chevrolet repair. This dedication to quality repairs has earned us a place in the Assured Performance Network. We can guarantee our repairs with a Lifetime Warranty because our technicians follow the factory guidelines for repair, and have the equipment to make sure the job is done right. It’s your choice, not the insurance companies, where your vehicle is repaired. Choose Triangle Collision, the Cary, NC area’s premiere GM Recognized Chevrolet Body Shop & Collision Center. By bringing your vehicle to a GM Recognized Chevrolet Body Shop, we can restore both your vehicle and your peace of mind. Modern safety features need factory approved parts and repair processes to guarantee their integrity in the event of another collision. Cutting corners during the repair process can have serious consequences. Our shop is equipped with BASF refinishing technology. BASF is the industry standard for paint repair and is guaranteed to match your Chevrolet’s original color. By having this all in one convenient location you will not have to worry about transporting your vehicle before it is fully repaired.